Chrysler has launched a new commercial to promote the Chrysler Pacifica Plug-in Hybrid, the world’s first electrified minivan, described as “the family vehicle for California”. 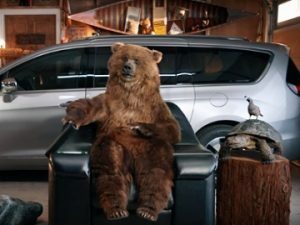 The 30-second spot, titled “Chair”, is presented as a “Pacifica Service Announcement” and features a California grizzly bear sitting in a vibrating recliner with a built-in fridge and talking to the camera. “We’ve all been there. You’re innocently surfing the web after one too many Coladas and you order an expensive massage recliner with a built-in fridge.” – the bear says, making then reference to Chrysler’s competition, Honda and Toyota. “Don’t fret unless you drive an Odyssey or Sienna because they don’t offer hybrids, which means with all the money you’re saving by getting your Pacifica Plug-in Hybrid, you can afford to splurge on the finer things.” – the bear adds, opening a bottle of Colada from the fridge, that splashes him right into his face, making a desert tortoise and a California quai (other two officially designated of California, alongside the grizzly bear), uttering specific sounds.